“If you were looking for evidence of how recently Syrah has risen to prominence in South Africa, you could do worse than visit Sijnn in Malgas and Porseleinberg in the Swartland – remarkable vineyards at opposite ends of the winelands. These very different sites are producing two of the finest examples of the grape in the country and yet their first vintages were in 2007 and 2010, respectively”. It would be a fair assumption that there are few, very few producers in the Cape that can honestly claim that their specific vineyard wines display a ‘true’ sense of place. This is something that is best understood when one has the opportunity to physically walk through the vines and then experience a clear correlation between the site itself and the resulting wine tasted, once back in the confines of the cellar. I’d include the likes of Fable Mountain Vineyards in Tulbagh as one example and I’d agree with Tim Atkin on his observation of Porseleinberg in the Swartland. Include also the ‘maritime’ varietals produced at Vergelegen. Now, add to that rather short list – Sijnn. For those (like me) who remain jaundiced by the average wine marketer’s generic blurb about ‘terroir’, then I suggest you source a bottle of Sijnn Malgas Red and Malgas White, to help grasp and understand the concept of the true meaning of this otherwise misquoted and most-abused word in the wine trades lexicon. For the wines that come from these 15 hectares of vines are unique. They taste of from where they come. 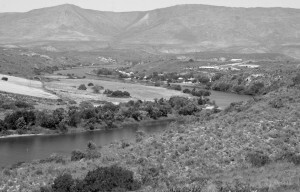 Sijnn (pronounced ‘Sane’) was born in the early 2000s after David and Rita had identified the potential of this unproven site and it takes its name from the local Khoisan word for the region. Justifiably, it lays claim to being one of the most remote vineyards in the country, with the sign at the gate boasting Sijnn to be ‘the only First Growth in Malgas’. The fact that it is currently the only growth of any kind is somewhat incidental. From the Trafford’s Stellenbosch cellar, this represents a two-and-a-half hour drive along the N2 to Swellendam, before taking a right-hand turn and travelling for a further 40 kilometre along a dusty, bumpy dirt road which runs vaguely parallel to the course of the Breede River. In fact, the closest vineyards are further up-stream in Bonnievale at the eastern-most limit of the Robertson wine region. There are certain similarities to the vineyards of Robertson; the pudding stones that one expects to find along the course of the Breede and the scrub. But that’s where it ends. The topography is different, the light is different, as is the climate. There’s certainly none of the linear-trellised monoculture one experiences in much of Robertson where vines are grown to be worked and harvested by machine. Once through the gates of Sijnn, one could be convinced that you’ve just entered the upper-reaches of the Douro: squat, widely-planted bush-vines sit on a high plateau on a meander in the river below. This is unchartered territory and the Trafford’s sense of pioneering a new region has to be admired. 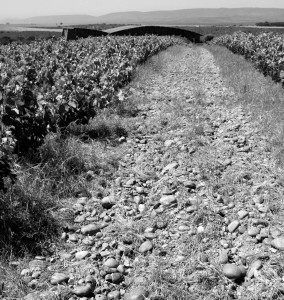 Whilst your average grapevine is capable to perform in most environments, this is probably one of the most marginal sites in the Cape: low-vigour soils composed 90% of shale and stones; an average rainfall of less than 350mm per year and a southerly wind that blows twice as often (and probably twice as hard) as in Stellenbosch. It’s not surprising to discover that the vines planted here a decade or so ago show very little sign of reaching maturity. But the combination of poor soils, low rainfall and strong winds allow for wines which display a profound intensity and unique flavour profile. They are not easy; certainly not pool-side quaffers, but they come with an identifiable earthy, phenolic pithiness that is present as much in the white as it is in the reds. Incidentally, the rather abstract labels that adorn the bottles are adaptations of the soil profiles from holes dug all over the property prior to planting and help to illustrate the essence of Sijnn perfectly: stones and shale. The decision on which varieties to plant was well-considered and took into account the growing environment in which they were expected to perform. No one here took the easy commercial option of planting the usual suspects of Chardonnay or Sauvignon Blanc, Merlot or Pinot Noir. Complex growing conditions usually dictate that blends are often the most viable option; with one variety performing better or worse given the conditions of any specific growing season. They also tend to make the most interesting wines. A tour of the Iberian Peninsula and the Mediterranean rim help to confirm that theory. So one can currently expect to taste in the Sijnn cellar the following grape varieties which, at any given point in the annual cycle, might exist as mono-cultivars or already form part of a blend; co-fermented or not. In addition to these, there are either new (or planned) plantings of Grenache, Tempranillo, and Tinta Cão for reds and Assyrtiko, Petit Manseng, Grenache Blanc, Verdelho and Vermentino for the whites. I am reliably informed that the Trincadeira – which was sourced through official channels – was originally presented to the South African wine industry as Tempranillo, but the authorities had to back-track, admitting that they had incorrectly imported the wrong variety by mistake. The cellar on the farm is a new-build, designed by architect David and erected in time for the 2015 harvest. Until then, the grapes had been carefully placed into lug-boxes and transported back to the Stellenbosch facility for processing. Contemporary in design, the building uses many of the materials located in the vineyard in its framework. The sandstone boulders used in the construction of the walls ensure that the semi-subterranean ‘chai’ blends harmoniously into the contours of its surroundings. Forever modest, David also wants to down-play his role in the venture despite being the driving force. The reason for that is partly explained above in the confusion that has arisen with people seeing Sijnn as a ‘second wine’ to DeTrafford. The other, is to allow young winemaker Charla Haasbroek the opportunity to find her own way in the vineyards and cellar. A graduate of Stellenbosch University, she worked stages at both Kanonkop and Tokara before joining Sijnn in December 2014. Both Charla and the cellar should be considered welcome additions to the project. More details on Sijnn and specific information on both the site and the individual wines can be found on the website.